Thank you for this thread, rhm. I see lots of possibilities for me. First, I have a 58cm Surly Cross Check, and I'd like to replace it with a 56cm Cross Check only. 54cm Peugeot UO-8 which needs alignment. Market value: $0 or less. 68cm Nishiki something or other. Not high end. Yes, really 68cm. bikeforums sure has a lot of night owls! I'm not normally up this late. The trouble is that my wife is away. You are 2nd in line for that one. I should know in the next couple of days if the current interest work out (I will PM you if it falls through). Shipping on that one is going to be about $70 +/-$10 depending on how daring I go with the packaging. I have this 1992 Specialized Rockhopper comp rigid MTB frame/fork. 17" c-c, 18" c-t. Tange chromoly throughout, TIG welded. (Bought new by my wife in 1992, originally equipped with full Deore DX/LX). Looking to trade for a similar rigid MTB frameset in a larger size (20-23" c-t). Okay, I think I get it--this isn't an ISO thing for high-end desirable frames, but a way to get underused, unloved frames out into the world where they'll do some good. 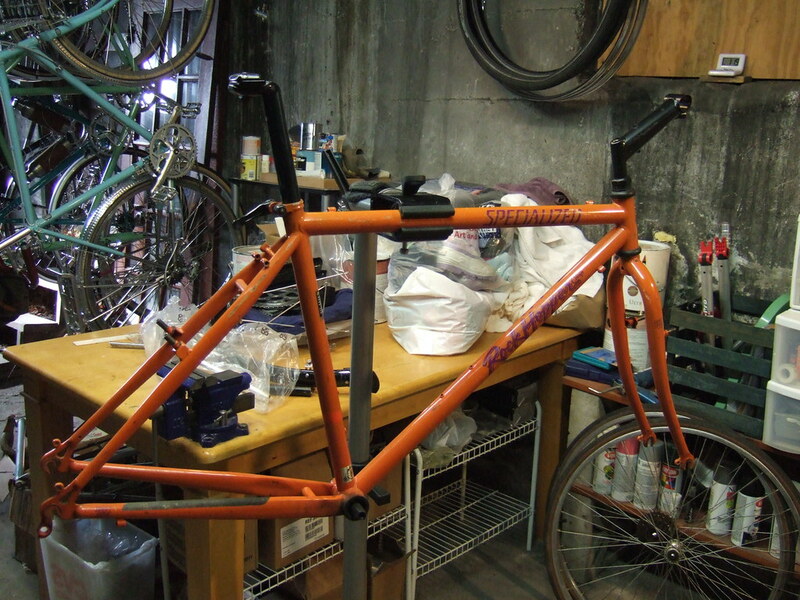 And in fact, I've been wanting some sort of 25-inch hi-ten frame with bad paint to make a winter beater out of. The only problem is that I don't have anything similar to trade. I'll keep my eye out for a 23-inch frame of the same general kind--easier to find than a 25, probably. Who's going to step up to the plate and develop a system to make all this happen? It won't be an old luddite like me, I don't think. That Centurion interests me in particular. Standalone, You are now 3rd in line behind Glennfordx4. I've been wanting some sort of 25-inch hi-ten frame with bad paint to make a winter beater out of. The only problem is that I don't have anything similar to trade. I'll keep my eye out for a 23-inch frame of the same general kind--easier to find than a 25, probably. I might be game for the univega. The most comfortable I've ever been on a bike was on a 67 or 68 Lotus w/tange that a student of mine grabbed out of a dumpster. Kid couldn't have been even 5'10" but he still wouldn't sell it to me! Trying a spreadsheet. It's a google document that anyone with the link can edit, so feel free to add your own entries. I have it set up so that it's more of a "game" than a trade forum. There are abstract frame descriptors, but nowhere is there an identifying frame name. If someone really wants to let others know what they have (and ruin the game! ), they can post here and let the spreadsheet reader trace back the description in this thread. Hopefully those that wish to play the game can use the spreadsheet and those that wish to do more of a traditional trade can just post in this thread. If you can think of another necessary category, feel free to add it in. I haven't filled in my entry yet, b/c I don't have a frame to trade yet . jonwvara, I have a 25" Atala Giro D'Italia you can have. It's similar in quality to a UO-8 though I'd expect it to be Italian-threaded. Hmm, I have some Italian BB cups that some weirdo sent me. I'm looking for just about anything decent in 58-60cm. Should be considered frame/fork/headset/seatpost although I can prob. send it with more parts like that white Mtn Rack. Wheels and derailleurs are gone. Last edited by BluesDaddy; 12-28-10 at 10:46 PM. I might be game for the univega. I need to dig it out of the top of the barn. I will PM you with pictures and a better description in the next day or two. I hoping it gets above zero tomorrow. Since this thread has several parallel tracks going, I will offer my viewpoints. Ignore at your pleasure. 1. Currently 99% of my web browsing is with a cell phone (Blackberry Curve, no Flash page functionality) so anything that gets too involved bumps me out. 2. The Google spreadsheet deal requires a Google membership. Free or not, that log-in requirement adds another hurdle, not counting the editing issue. I also don't know how viewable it is on my phone, but that's a personal matter. 3. Location of the item would be nice to know. Crossing country borders adds a level of complexity as well. It could be a good deal for someone in Somalia swapping with someone on the Island of Sodor, but it's probably a nice thing to know the respective locations up front. I know that if I see something local or even semi-local then I'd be more motivated than to hassle with shipping. 5. I would request that people go back and edit their posts, since this site allows that without a time limit, once a deal is done. I personally will use this like the local CL and assume anything more than a few days or pages old is potentially gone. If interested I'll still inquire, but I suspect I'll just check the newest page and quick scan for local deals, and also for special items I'm willing to ship for. 6. I'll check the basement and garage to see what I have and what I haven't gotten around to working on. And I'm thinking of the Lotus, hanging there frozen in time, having been left outside by the previous owner, seatpost came out with hefty effort, haven't done anything else to it yet, has decent potential but realistically a great unknown until it is fully disassembled with what will probably be a great amount of effort, and even if it is a fair fit I just haven't been motivated to mess with it yet. Maybe I'll offer it up, or maybe I'll just let it hang like a side of beef in the garage until next summer. Or maybe I'll offer up the bullmoosed bar Ross MTB instead, or something else. Anyways, just some rambling personal view points. Ignore or not at your choosing. Back to browsing on a 2" screen. A UO-8 equivalent actually sounds like pretty much what I'm after, but I've realized that I'm already up to my ears in winter projects. Let me think on it and get back to you--shipping is always a pain when moving frames around, especially low-value ones. As soon as you mentioned that it was an Atala I thought of those cups. It's sort of C&V version O. Henry's short story "Gift of the Magi," isn't it? But hang onto them--if I do eventually end up with the frame, I expect that I'd throw in an Italian-threaded Shimano cartridge BB. I changed the spreadsheet settings to let anyone do it without login. I hadn't noticed that the other option required signing in to google, apologies. What is a Novara Triforma? I ran a google image search and came up with an ocean freighter ship. Just curious at this point, thanks. No apologies necessary, I'm constricted by the phone and the spreadsheet viewer is funky at best. thanks! Very cool, can I suggest adding a column for Make/Model? What is a Novara Triforma? It is actually a 'Trionfo.' It is a road model of Novara sold by REI. I could not remember the name when I did the post. I'm half kidding. Is it OK with you if we make improvements to the design of the spreadsheet? I'm thinking that rhm should post the link to the spreadsheet in his the first post so it is very easily found, because this thread could likely grow quickly and then we could easily refer back to the first post for the link rather than search through or try to remember it is on page three halfway down. I have a few others that IMO just would'nt be practical to ship. I'd welcome Chicagoland or St. Louis area trades for these as well as a boatload of others though. Last edited by r0ckh0und; 12-29-10 at 01:59 PM.